With beer sales flat and consumers switching up their alcohol purchases to wine and spirits or hard seltzer, 2018 may turn into a pivotal year for the beer side of one of America’s biggest booze makers. Following a trend that started years ago, Boston Beer’s Samuel Adams portfolio of beers is finally treading close to a Brewers Association-defined line of a defined “craft brewer.” According to numbers estimated by the trade organization, Samuel Adams accounted for just more than 53% of Boston Beer’s total brand portfolio in 2017, a drop from almost 58% the year prior. If and when that number falls below 50%, Boston Beer would no longer meet the "traditional" tenet of the BA’s definition, which states that a “craft brewer” must have “a majority of its total beverage alcohol volume in beers whose flavors derive from traditional or innovative brewing ingredients and their fermentation.” Because flavored malt beverages (FMBs) and cider are not considered beers under the BA’s guidelines, Boston Beer’s fastest-growing brands have put the iconic business in the crosshairs of a definition it essentially helped to create and popularize. Quinn would not address the specific issue of falling out of the Brewers Association’s craft brewer definition, saying that any reported numbers—estimates or otherwise—are “not comprehensive of everything.” She added that "anything reported about volume breakdown is speculative and estimated." Because Boston Beer is a publicly-traded company, it doesn’t share specific production figures by brands, instead only reporting its total beverage alcohol figures across all products, which Quinn did not dispute. However, Bart Watson, chief economist for the Brewers Association, noted specifically the effort he goes through to create estimates, combining scan data from off-premise stores, point-of-sales information, and TTB production numbers. He also considers other industry analyst reports, such as those of Beer Marketer’s Insights. Boston Beer has not publicly questioned figures in the past. "As one of the bigger numbers in the overall craft beer data set, I've spent more time on the Boston estimate than many in recent years,” Watson says. As to whether Boston Beer is at risk of losing its craft brewer designation, Watson says it wouldn’t be appropriate for him to speculate on any individual company’s sales trajectory, “especially given how much change there is in the beer market right now.” He adds that adhering to the tenets of the definition will continue to be something the BA evaluates for every member brewery. It’s a strange situation, as the success of craft beer would not have happened in the way it did without Jim Koch’s hearty sales pitch of Sam Adams and its flagship Boston Lager. But as the industry has tightened around the business, the publicly-traded parent company has been forced to continually diversify its set of products as a means to keep sales strong and shareholders happy. In a shifting market, the creation and success of new products has been a boon to help the company. Last year was the first that the Sam Adams family of brands didn’t lead Boston Beer in sales volume in IRI-tracked grocery, convenience, and other stores. The leader was, instead, Twisted Tea’s collection of brands, which sold about 2% more case equivalents. Through the first six months of 2018, the Twisted Tea family far and away paced volume sales for the company in IRI MULC stores, accounting for almost 37% of sales. The collection of Sam Adams beers (25.95%) were barely ahead of Angry Orchard (25.59%) thanks to the rocket ascension of Rose Hard Cider, which has sold $20.2 million in IRI-tracked stores, more than twice as much in sales as Rebel IPA. These sales only reflect off-premise stores, however, and don’t take into account the vast network of taps at bars, airports, and sports stadiums that pour Boston Beer products. Instead, the 2018 IRI numbers simply showcase the ongoing changes for the company. According to an ongoing analysis from the past three years (disclosure: it’s my own) based on production estimates by Beer Marketer’s Insights and the Brewers Association, Sam Adams has gone from almost 90% of Boston Beer’s overall production in 2010 to 53.2% last year. Through six months of 2018, the IRI-tracked, off-premise numbers are actually 3% higher than in the same timeframe compared to last year, though that's mostly because of new releases and better performance from Seasonal volume. Flagships Boston Lager, Rebel IPA, and Variety Pack are down January through June 2018 vs. 2017. In 2018, at least, bright spots have come from the launch of Sam '76, now the #3 brand for the company in its first year of existence, and New England IPA, which amassed $2 million in sales in four months of distribution since debuting in March. In size and scope, it’s hard for many breweries to easily compare to what Boston Beer is doing—and must do—to keep stock inching upward. Smaller operations like Wachusett Brewing Co. turned to hard seltzer, and Rhinegeist Brewery to cider, as ways of diversifying their offerings—and to great success. But according to IRI numbers for off-premise sales only, the alternative product lines to beer amount for about 13% (Wachusett’s Nauti Seltzer) and 14% (Rhinegeist’s Cidergeist) of total off-premise sales. But this still ignores the bigger issue: what will become of Sam Adams’ designation as a Brewers Association-defined craft brewer in the years to come? Especially with their bottles now adorned with the organization’s official seal for its designated “small and independent” brewers? In the last three years, the total production level of beer has decreased 1%, 8.3%, and 13.6%, according to numbers estimated by the Brewers Association. 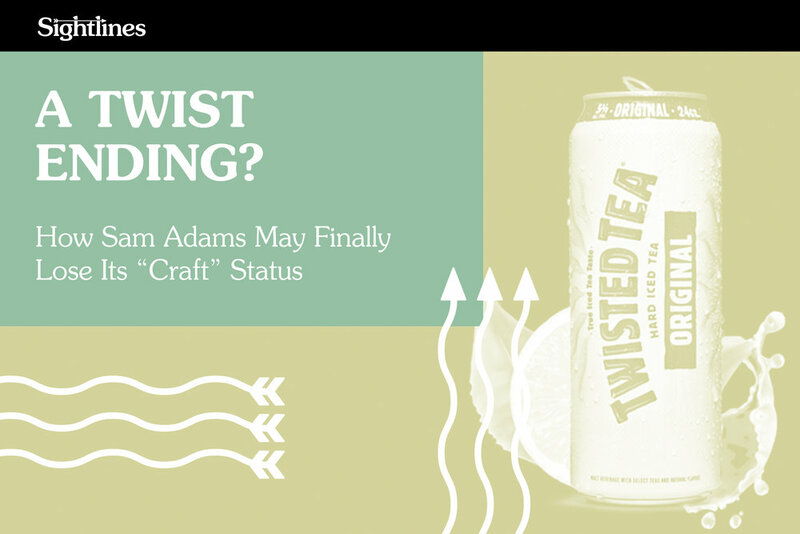 If trajectory holds for the runaway success Boston Beer has had with Twisted Tea (average year-to-year 18.6% volume growth in IRI stores over the last four years) and Truly Spiked & Sparkling Hard Seltzer (volume sales almost the same in six months of 2018 vs. the entirety of 2017), Sam Adams beers could fall below 50% of Boston Beer’s total beverage alcohol volume this year or next. In 2011, the last time Boston Beer came close to falling outside the BA’s craft brewer definition, the organization updated its designation to allow for breweries to produce up to six million barrels. That kept Sam Adams under the “small and independent” umbrella. It remains to be seen if the BA will make another update to keep Boston Beer in the club this time.